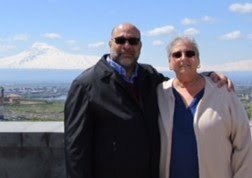 TheArmenianKitchen.com : Bastegh is the only "Nanny Candy" worth eating -- if you can make it right! Bastegh is the only "Nanny Candy" worth eating -- if you can make it right! Have you ever heard of "Nanny Candy?" 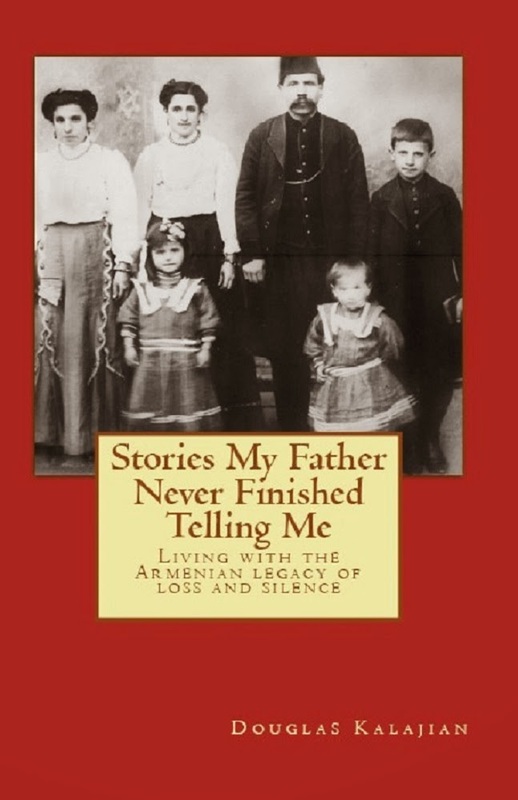 If you’re Armenian, and you have or had a grandmother, then you know exactly what I’m talking about. My grandmother, Yeranuhe Nanny, always had candy in her house - but not American candy like Hershey’s Kisses or Snicker’s bars. Her favorites were candy-coated dried chick peas, and pastel-colored, sugar covered almonds that were so hard you were afraid you’d break a tooth. Then there was the glass bowl on her coffee table filled with sugary, multi-colored hard candies that would invariably clump together from the humidity, making it impossible to separate. Occasionally, as we’d be driving home from church, Nanny would rummage through her purse, pull out a crumpled but clean tissue, and offer us kids some of her “special” traveling candy. She’d carefully unwrap the tissue to display the selection, expecting us to joyfully pick a favorite. Much to our dismay, we’d find that each piece was covered in tissue lint. She never quite understood why we rejected her sweet treat offer. There’s only one candy that Nanny had that we didn't reject. 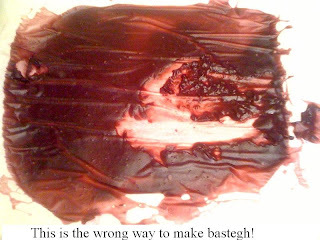 Bastegh, or Fruit Leather. Hers was a homemade delight. She didn’t make it often, but when she did, it didn’t last long because it tasted so good! Nanny used the grapes from her backyard vine and extracted the juice- a messy and tedious procedure. To make things simpler, the modern-day cook is wise to use bottled grape juice. 1. In a large pot, combine the juice and sugar. Heat gently until the sugar begins to dissolve. 2. Slowly whisk in the sifted flour. Be sure the flour is well-blended to prevent lumping. If lumps appear, carefully pour grape mixture through a strainer, discarding any lumps. Return grape mixture to pot. 3. Bring mixture to a gentle boil, stirring constantly. 4. When the mixture begins to thicken, remove pot from the heat. Allow to cool to lukewarm. 6. Allow to set for 24 hours. 7. Hang the fruit sheet(s) on a line to dry - about a day or two. If drying indoors, place parchment or newspaper on the floor - just in case! 8. When the fruit sheet is dry, carefully peel away the parchment paper and discard. 9. Sprinkle cornstarch on the fruit leather to prevent it from sticking. Cut fruit leather into strips or squares. Wrap the leather around a piece of walnut - or any other kind of nut, and enjoy! Eating it plain is great, too. Place pieces in a plastic bag, or cover tightly in plastic wrap, and store in the refrigerator. Don’t like grape juice? This recipe can be made with apple juice, too. WARNING: Don't try to make bastegh when it's hot and humid. Trust me, I know. After the bastegh set for 24 hours, I hung the sheets of grape-covered parchment paper, as directed. Help, we are looking for a recipe for rojeeg. Thanks for your request, Carol. I'll post a full recipe for Roejig on December 29th - be on the lookout for it. You have no idea how enlightening this post is. We are huge fans of the Syrian dried apricot paste that can be found in most Arabic / Mediterranean stores. My father always called it Bastegh but I never realized that it wasn't that specific product. Now I know! Thank you for posting this recipe. My kids are obsessed with bastegh but we only buy it from the church bazaars. My grandmother would make it from the grapes in our yard, and I've been scared to try it that way. But making it with grape juice sounds a lot easier!!!! Have you ever made this with a food dehydrator? Tamar, The last time I tried using the food dehydrator, I turned apricot halves into hockey pucks. Does using a dehydrator work well for making bastegh? Since my grandmother had an apple tree in the back yard, my only exposure to bastegh was from rendered apples. We called it apple candy. She would add a bit of lemon juice to it. The rendered apples were then spread onto bed sheets, sprinkled with corn starch, and then hung on the line to dry. Just because something is "traditional" in no way makes it "correct" or even good. Consider how many ethic dishes still subject children to nothing more than a history lesson of how poor, culinary limited, and very hungry their ancestors were. There is *no* rational reason to make Bastegh with flour. Fruit leather by any other name is fruit leather. The flour serves no other purpose than to thicken it, which can be done without the introduction of the unnecessary flavors of flour. Use Xanthan Gum, powdered sugar, and a food dehydrator. You do not have to cook it, so you do not drive off volatile flavor compounds. Xanthan Gum is not healthy. Dear Sato, I'm making inquiries about this candy, but so far, no one has been able to help. I'll try digging around a little deeper. If nothing turns up soon, I'll post your request and see what happens. The candy you are referring to is a pistachio nougat, called Gaz in Arabic and is very popular during Easter time. I don't know what the Armenian word is, my Dada always called it Gaz. do you have a recipe for Khash or Patcha? Wash hooves thoroughly and make sure they're clean. Cut tripe into small chunks. Put the feet, tripe and fat into a large kettle. Cover with cold water. Bring to a boil then reduce heat to a simmer. Skim the surface regularly of any foam; discard. Add more water if necessary. Simmer for about 10 (ten) hours. Add garlic as khash is cooking. Add salt, to taste, at the end.